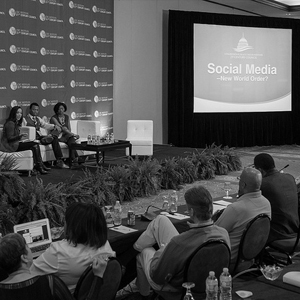 The 21st Century Council is a program of the Congressional Black Caucus Institute. Our Executive Committee is comprised of business executives, educators, labor representatives, policy advocates and community leaders. The Executive Committee meets quarterly with an annual meeting held in South Carolina during the first quarter of each year. Members divide into small issue centered committees according to their areas of expertise, and draft recommendations with supporting language. The Executive Committee as a whole then develops consensus to ensure all viewpoints are represented and analyzed from a widely diverse perspective. Executive Committee members may also host a Conversation Series event throughout the year to present vital issues to members of Congress. The host targets a topic of interests and invites up to 5 industry guests. The 21st Century Council provides food and space for the event, and also organizes distribution to members of Congress and Executive Committee Members. Due to the popularity and limited number of Conversation Series events, they are held on a first-come, first served basis.